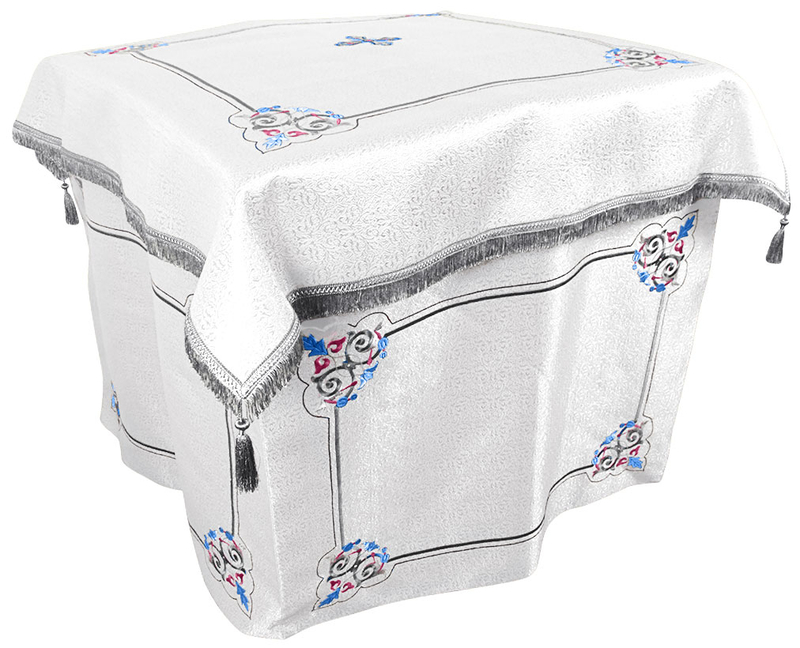 Orthodox Church liturgical Holy table vestments (white-silver) by Istok Church Supplies Corp.
Searching for the best quality white-silver Holy Table vestment? 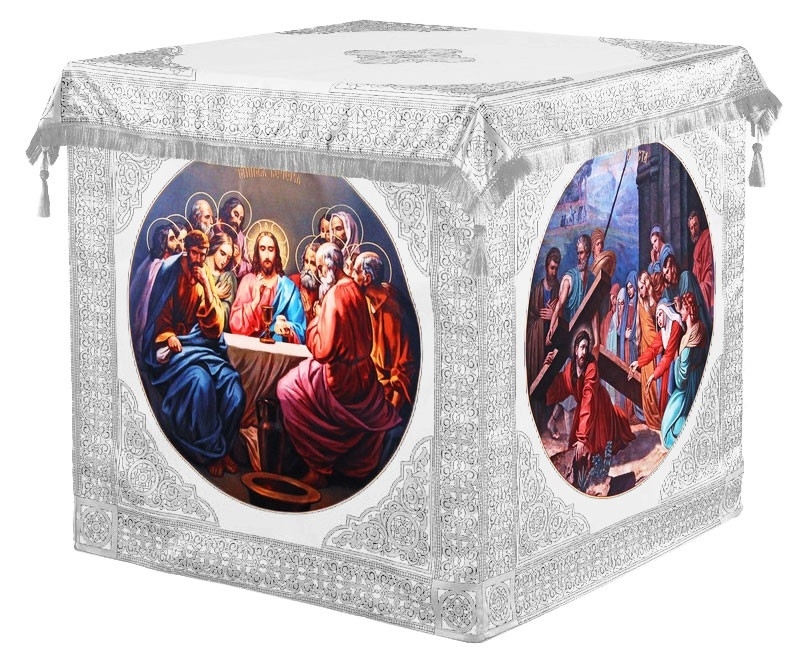 Istok Church Supplies has it in the right style, fabric and liturgical color combination. What’s more, it can be made-to-order so that it perfectly fits the Holy Table at your church! The most sacred piece of furniture at the most sacred space in an Orthodox Christian church is to be treated with respect. Our white-silver Holy Table vestments are designed to bestow dignity and solemnity to the Holy Table and its surroundings. We offer these vestments in the finest fabrics including silk, brocade and richly embroidered German velvet. Prices range from around four hundred dollars to over two thousand dollars, so you’re sure to find something that suits your budget. 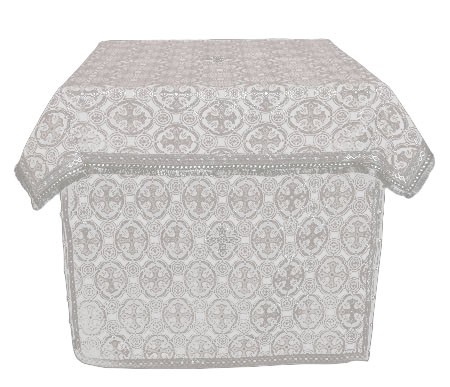 White-silver Holy Table vestments in brocade and silk feature intricate patterns. All the vestments in this collection feature full cover tops that hang neatly over the sides and covers for the bottom portion of the table. We provide standard decoration in the form of gallon that’s free of cost and customers have the option to upgrade with premium decoration and velvet inserts for an additional cost. 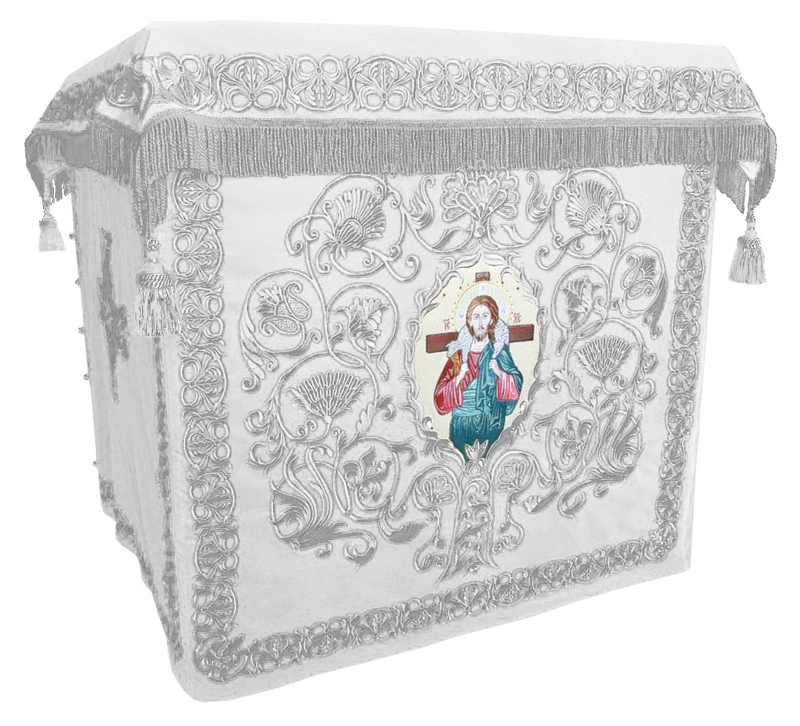 Featuring rich Christian imagery on natural German velvet material, our beautiful hand embroidered white-silver Holy Table vestments are a class apart. Customers can select from a variety of designs ranging from simple floral to elaborate renderings of Biblical teachings. Customers can get their Holy Table vestments customized by specifying the required size during order placement. Bespoke orders may take more time to ship, so order early in case you need it for a special occasion. We accept various modes of online payments and ship internationally to locations in the USA, Canada, Europe and Australia. Once you explore our collection, we are sure you will agree that Istok Church Supplies is the best online store for excellent Holy Table vestments in traditional style!